Beach and Travel guide to Maragogi and Japratinga Brazil including best beaches, where to stay, and what to do. travel guide on top recommendations foe what to do, where to stay, and where to eat on the island of Boipeba in Bahia Brazil. Salvador de Bahia should be on everyone’s “Must See” list for Brazil. 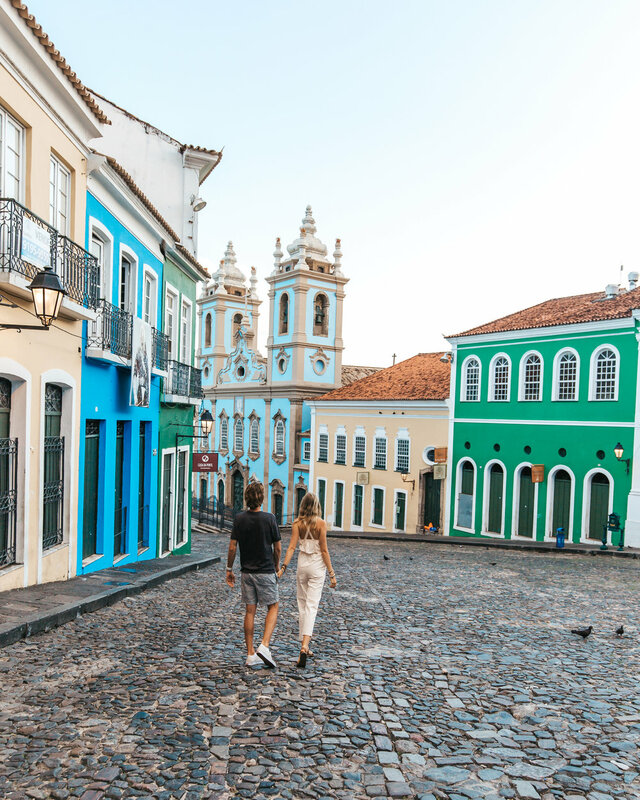 As the first colonial capitol of Brazil, this city really has a lot to offer. Not only are there endless stretches of beaches to enjoy, but there’s a Historical District dating back to 1549 that has all the feels of a charming European town. There’s jazz concerts on the corner at night, more picturesque churches than you can count, cobblestone alleyways with twinkling lights and did we mention those beautiful shore lines? 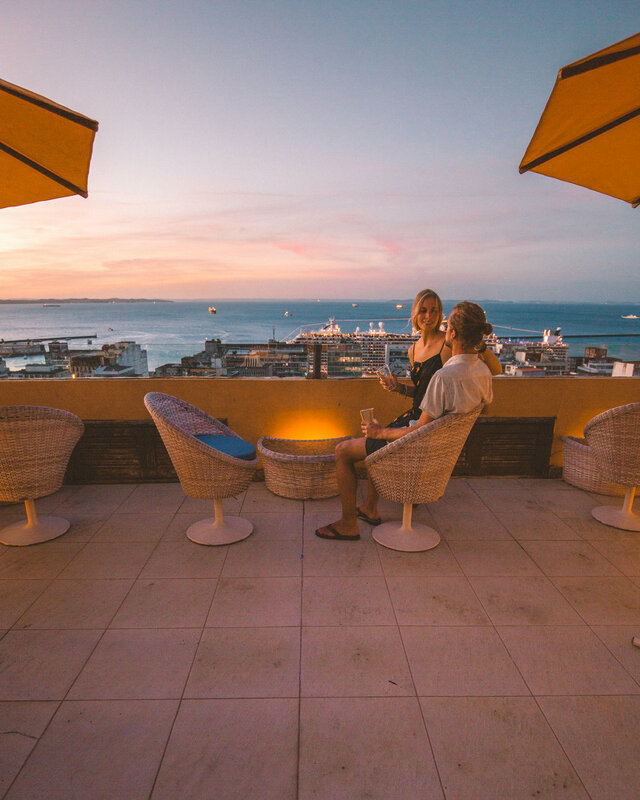 At first Salvador wasn’t even on our radar, but we’re so happy we decided to check it out. Salvador’s Airport is one of the largest in the country. You can find direct flights from Rio or Sao Paulo (a lot of international flights will connect through one of these two). If you’re exploring a bit more around the country, it’s also easily accessible from many other regional airports, by bus (overnight bus is actually not a bad option as Bahia is quite a large state), or even by boat. Bahia Brazil also has a lot of different remote and untouched coast line to enjoy including Trancoso and Boipeba (both of which we spent a few days at). 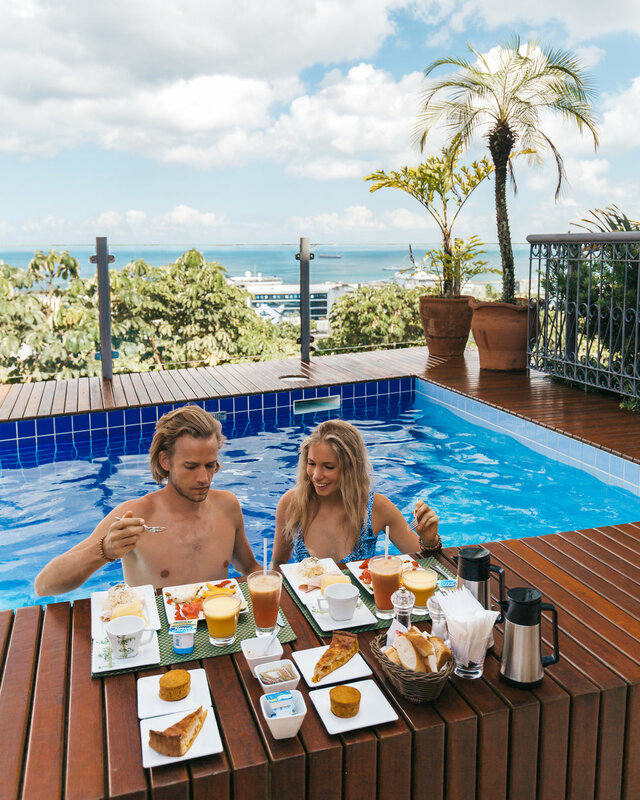 Our recommendation would be if you’re planning to head up to Salvador, allow for a few extra days to see the pristine coasts that Bahia has to offer. It is easy to jump over to one of the many secluded beaches or islands in the region. Special Note: If you are coming by boat from the south, the direct ferry from Morro do Sao Paulo can be rough. Unless you have an iron stomach, this ride can cause some sea sickness. Even though we consider ourselves boat enthusiasts, we still found ourselves sick and basically kissing the dry ground when we landed. If you’re considering a boat, take a few of the smaller ferries that don’t have to cross the open water. If you do end up on this direct ferry, be sure to snag a spot near a door or outside with some fresh air! 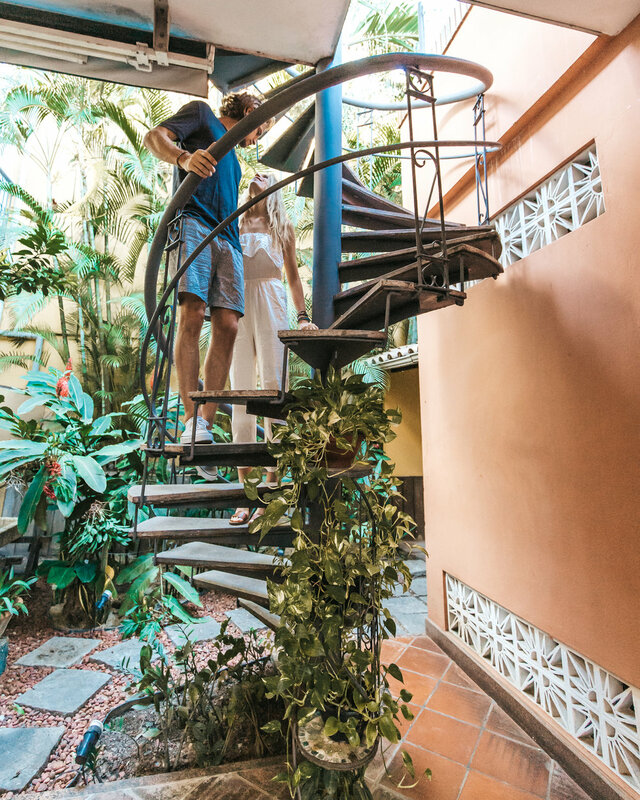 Whether it is your first to to Salvador or 100th time, every time we’d suggest to stay in the old Historic Center. There is just something romantic about the cobblestone streets and pastel colonial style buildings that’s undeniable. It’s also where a majority of the most prominent churches and many of of the touring festivals or concerts are based. This means you won’t have to worry about finding transportation or parking to get where you want to be. Everything you want is conveniently located in one happening place. Every morning we woke up to catch sunrise in the Historic Center. 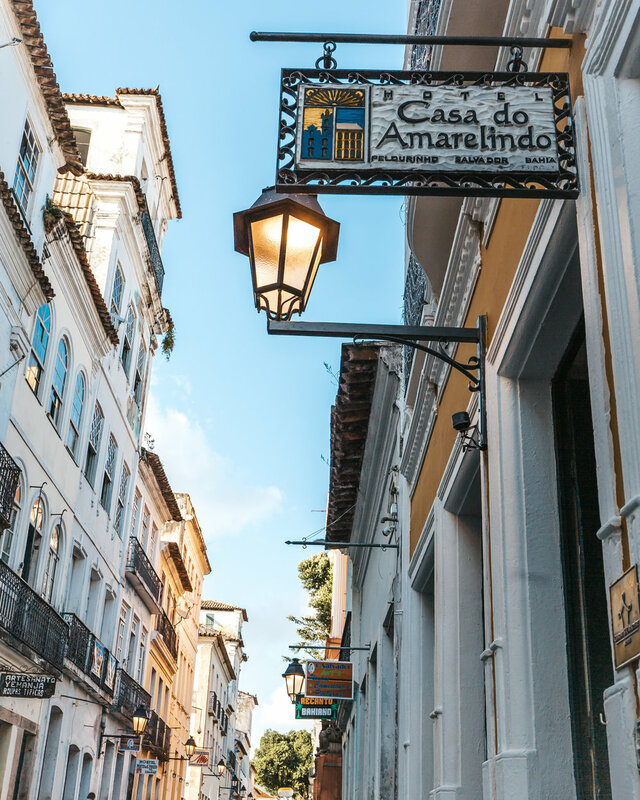 Casa do Amarelindo was perfect because all we had to do was walk out the door and we found ourselves surrounded by the cobblestone streets and colorful buildings. It is a photographer’s dream to say the least. 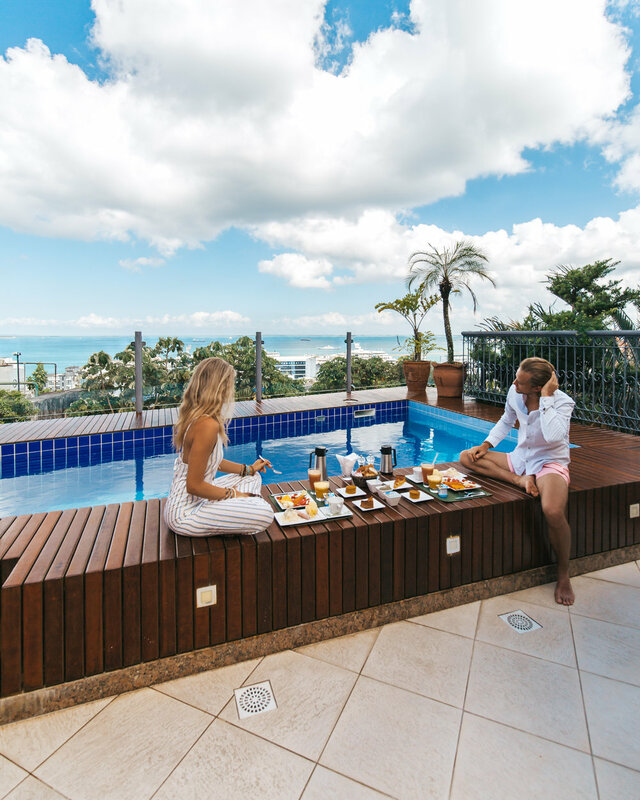 After a full morning of shooting, the breakfast at Casa do Amarelindo was everything we could of asked for and more. They just kept bringing platefuls of anything and everything from fresh fruit, to eggs. meats, homemade jams & breads, cakes, and the freshest squeezed juices. Eating locations were situated either in their indoor garden cafe, out by the pool, or even on the rooftop terrace. There’s a lot to do during the day in Salvador (more on that later down below). But the great thing about Casa do Amarelindo is that you don’t have to feel pressure to go out and do a whole lot. There’s a pool to relax by, gardens to sit in, and if you snag a room with a patio you could even spend a late morning enjoying the views and smelling that salty breeze from the shorelines. As mentioned previous, the hotel is conveniently located inside the Historic Center. There’s the most charming little square only a few minutes walk from the hotel where you can find a whole host of tasty restaurants, street performers, and maybe if your lucky, live music as well. However, if you’re tired from out adventuring all day, the restaurant in house is ranked as one of the top dining experiences in the city. So you may want to reserve one of your nights to be delighted by the chefs at Amarelindo. See the City by Boat: Brazil Sailing offers unique, completely customized tour options for seeing Salvador’s coast either privately or in a small group. You can choose to either spend sunset, all day, or even multiple days aboard a luxurious 50 foot yacht exploring some of the most picturesque parts of the region. This was one of the absolute highlights of our trip, as we got to spend the entire day aboard with the fun loving captain Hartmut. The day started with a bountiful breakfast aboard the boat with a fresh spread of tropical fruits and homemade treats. We then got to completely customize our day, filling it with island hopping, stand up paddle boarding, watching the sunset, and finally sailing back to the dock under a sky full of stars. Seeing the city from the water at night was stunning! They offer tours in English, Portuguese and German, so plenty of options no matter what language you speak. Stroll the Historic Center at Sunrise: As mentioned earlier, we did this each of the mornings we were in Salvador and it made for some really great picture opportunities. If empty (people free) streets and soft lighted alleyways sound good to you, wake up early and experience the history while the rest of the city sleeps! 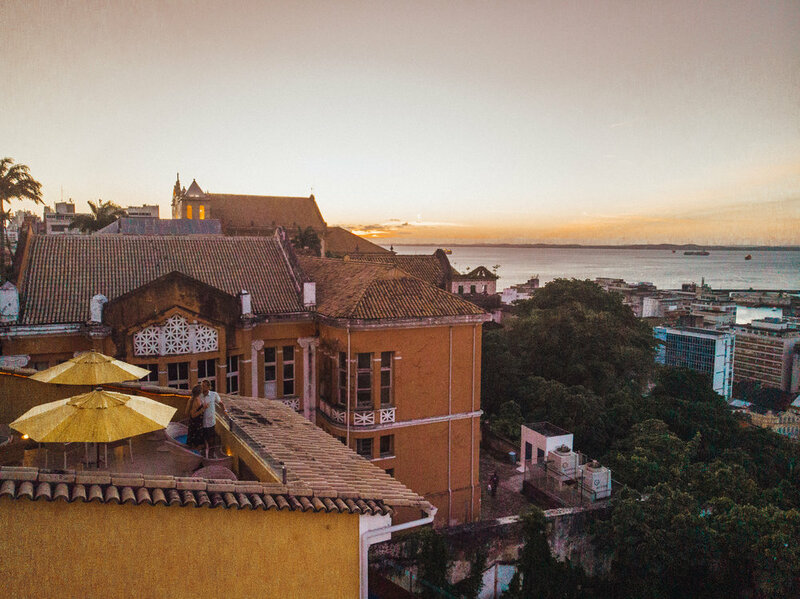 The top 3 places we’d recommend to see are Pelourinho , Church of Our Lady of the Rosary of the Black People, and Cathedral Basilica of Salvador. All are centrally located and have beautiful corners for pictures. If you don’t end up staying in the Historic Center (though we can’t see why you wouldn’t) you can have a cab drop you off at any of these locations and wander from there. Ride the Elevador Lacerda: The city is split into 2 levels, and this giant 85 meter elevator connects the two. Not only does it allow you to conveniently travel between the city and shoreline, but it gives you some fantastic views along the way. Certainly a very unique experience and great way to see a lot of the city at once. Farol de Barra: Got a thing for lighthouses? Us too. We saw this from our sailing day, but the lighthouse also includes a nautical museum and offers day tours. The lighthouse is adorned with iconic black and white stripes making it beautiful for photos, and offers some stunning views of the city. Try your Hand (and Foot) at Capoeira: Salvador is famous as the birth place to a special type of martial arts combining elements of dance, acrobatics, and music. There are many gyms across the city where you can try a class or possibly catch a match (depending on the schedules). Cuco Bistrô: Located in the courtyard of Largo do Cruzeiro de São Franscico, Cuco Bistro offers courtyard view seating with tasty grilled dishes. Their menu includes a variety of local meats, vegan and vegetarian options. But the best part, is you’ll have front row seats to any local concerts in the courtyard. Paraiso Tropical: Found on the hills of Salvador, Paraiso Tropical is a quaint, garden style restaurant worth a visit. Don’t be fooled by the casual setting, this restaurant is world renown for fusion of tropical herbs, spices, and fresh ingredients (many coming from the on-site garden). The chef has received many awards, and the ambiance here is that of an intimate home kitchen.